Our lab uses a combination of mouse genetics and in vitro experimental approaches to understand the basic molecular mechanisms of vascular development and disease. A main focus of the lab is to elucidate the molecular pathways associated with the vascular disorder Hereditary Hemorrhagic Telangiectasia (HHT). In particular, we aim to identify TGFb downstream targets that are involved in the formation of arteriovenous malformations (AVMs) that occur in HHT patients. We are also interested in defining the mechanisms of blood vessel fusion, as well as identifying genes with novel roles in vascular biology. Our favorite vascular model is the mouse retina, but we also investigate embryonic development. The paired dorsal aortae in an E9.0 sectioned mouse embryo during aortic fusion. 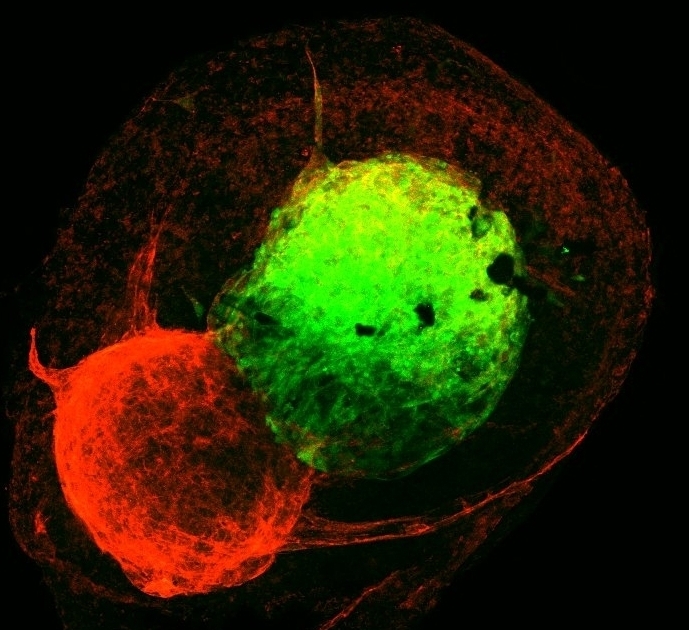 PECAM (green), Collagen IV (red). Flk-Myr (red) and Flk-EGFP (green) allantois vascular spheroids fusing in the presence of VEGF. Postnatal deletion of Smad4 in endothelial cells causes AVMs to form in the retinal vasculature. Isolectin-B4 (green). Also notice reduced vessel outgrowth towards the periphery, and enlarged vessel diameter in arteries and veins in Smad4 mutants. A previously uncharacterized vascular gene displays higher incidences of artery-vein crossovers when mutated, similar to patients with vision loss due to branch retinal vein occlusion (BRVO). P7 retinas from control (A) and mutant (B) mice. Isolectin-IB4 (red).